Is Windows Defender a Good Security Option? Windows Defender: Should You Use It? After years of leaving security software in the hands of third-party vendors, Microsoft finally introduced a free security suite for Windows in 2009. Nowadays, it's a fully integrated part of Windows 10. The basic idea behind Defender is simple: to offer real-time protection against a variety of threats, such as adware, spyware, and viruses. It operates quickly and uses few system resources, allowing you to continue with other tasks while a scan is running. The application can help protect your computer from many of the rogue programs online and those inadvertently downloaded via email. The interface itself is very basic, with three or four tabs (depending on your version of Windows) at the very top. To check if Defender is active on your computer running Windows 10, check in the Settings app under Update & Security > Windows Defender. (If you're a Windows 8 or 8.1 user, look at the System and Security section of the Control Panel.) Most of the time, you won't need to go beyond the Home tab. This area contains the controls to run malware scans and at-a-glance status reports for your PC. The Update tab is where you update the software's antivirus and malware definitions. Defender updates automatically, but updating the program yourself is always a good idea before running a manual scan. A quick scan looks in the most likely places that malware hides. A full scan looks everywhere. A custom scan looks at a specific hard drive or folder that you're concerned about. Bear in mind that the latter two scans take far longer to complete than the first. That said, running a full scan every month or so is a good idea. This is a basic, no-nonsense security product, so added features such as scan scheduling are not available. The simplest option is to make a note in your calendar to run a full scan on, say, the second Saturday of the month (or whatever day makes the most sense for you). Most of the time, you'll notice Defender only when it has acted against a potential threat. The Anniversary Update for Windows 10, however, added "enhanced notifications," which provide periodic status updates. These updates appear in the Action Center, don't require any further action, and can be disabled if you prefer. 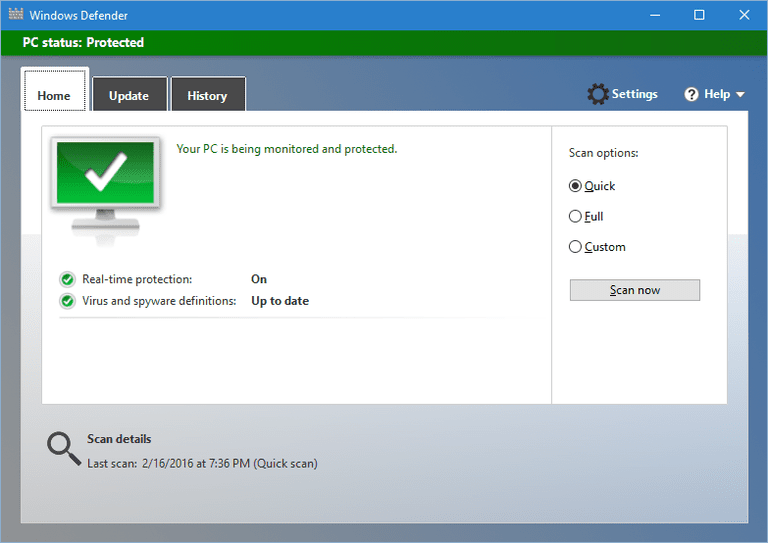 The update also allows you to run Defender at the same time as a third-party antivirus solution in Defender's "limited periodic scanning" mode, which acts as a low-impact backstop for added security. Defender is a free, basic, real-time security solution that's capable enough for the average user who sticks to mainstream sites, but it's not considered the absolute best option for PC security. Compared to third-party security suites in independent tests, Defender typically performs toward the middle or bottom of the pack. On the other hand, Defender's simplistic approach makes it a nice alternative to these security suites, which come with an increasing number of confusing features and tend to bug you regularly to run a scan, read a weekly security report, consider an upgrade, or go through a security check. Windows Defender, by comparison, needs only to be activated to provide adequate protection for your PC.